All Rewards are for FREE, but you need to have enough ClassTag Coins to claim a particular Reward. Currently, ClassTag Rewards are ONLY for classrooms and teachers, but parent engagement helps earn coins! The more you engage with parents, the more ClassTag Coins you'll earn. Often, we have a couple ClassTag Rewards that are "0" coins, but most require over "100" coins. Teachers can click on a Reward (on the Rewards page) to get more info and click on the “Redeem Coupon” to claim the reward. We recommend that you read the details of the Reward before you claim it. After you claim a Reward, you'll get an email from ClassTag with instructions on how to redeem. Classrooms/teachers can earn coins by: 1) engaging with parents AND/OR 2) referring other teachers to ClassTag. How do I know how many ClassTag Coins my classroom has? How is ClassTag Rewards able to provide all these supplies for FREE?! What do parents see when they go to ClassTag Rewards? For answers to these questions, keep reading! Balance: Coins your classroom currently has available to "spend" on free supplies. Earnings: Total coins your classroom has earned through teacher/parents engagement and teacher referrals. Purchases: Total coins used in getting free supplies. Click to see a detailed history of rewards your class has claimed. 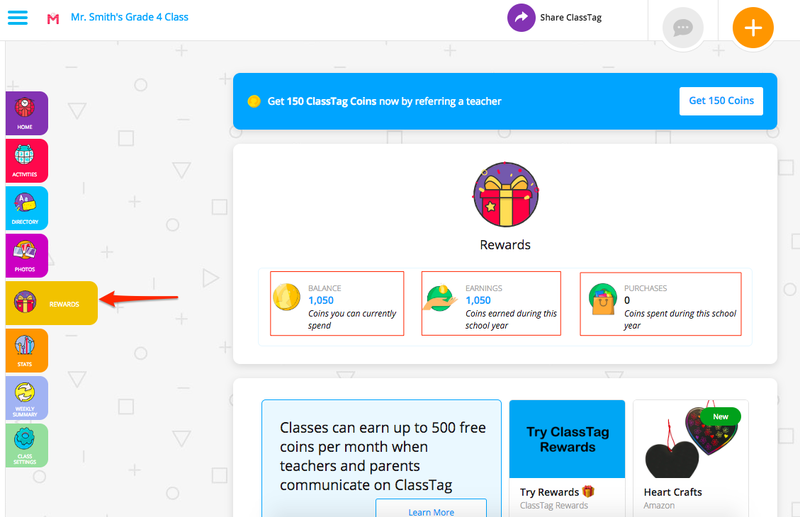 ClassTag Rewards offers are completely free for teachers. There is no catch! At ClassTag, we work hard to find educational partners who are interested in giving teachers free supplies that support your classroom. ClassTag also pays out of pocket for many ClassTag Rewards to help classrooms. As ClassTag continues to grow, our hope is that we can help even more! Currently, parents and teachers can both see the classroom ClassTag Rewards page, but only teachers are able to get free supplies. How to opt out of ClassTag Rewards?